Today was the day I went to the 35th. 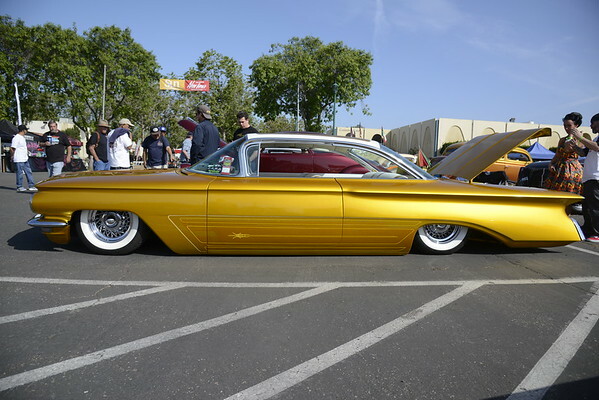 West Coast Kustom Car Show. It is a three day event held at the County Fairgrounds. This is probably the fifth year in a row I have gone there. It is a fun filled event, and everyone has nothing but smiles and good things to say to one another. There were probably over a thousand cars on display this year, it really was overwhelming! I don't think you could actually photograph them all in one day. Most of the cars are parked very close to one another to fit them all in, but there were many where I could get a bumper to bumper view. The one that stands out in my mind was the 1957 GM Concept Fastback Chevy! According to the owner this was a concept that GM decided not to build, only one is known to exist and it is not been touched, just the way GM built it back in '57 There were many beautiful cars, interesting people and cute girls dressed up in the Old School style. Justin and I had a great time cruising around, visiting with some old friends, and making a few new ones as well. I look forward to the Fathers Day car show next. So, always remember my motto: "Stay Stoked, and Stay Forever Young." Da Lieb!